Old Town is the heart of Scottsdale, and it has been since the very beginning. In the late 1800s, the Salt River Valley brought farmers and agriculture. And the charm of Scottsdale’s Western roots and breathtaking scenery drew scholars, artists and writers. Old Town Scottsdale’s vibrant culture was cemented early on and has only flourished since. It’s a destination place that continues to attract top resorts, the country’s best restaurants and so much more. 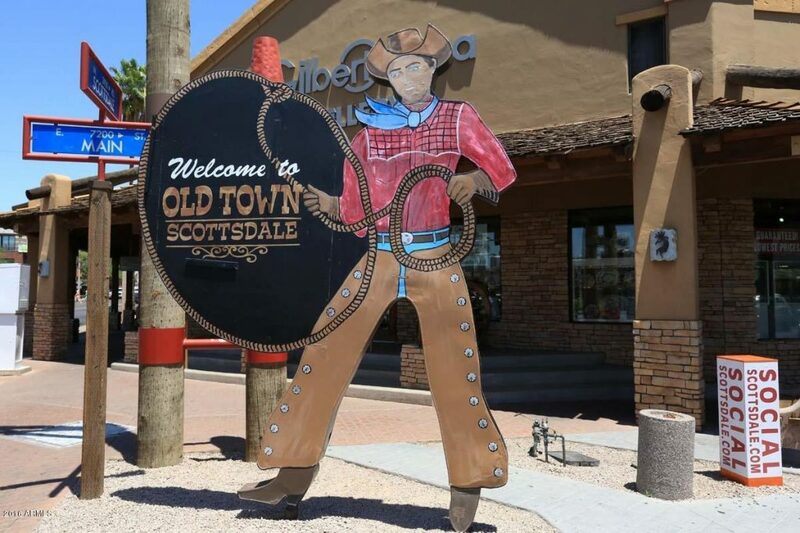 There’s a reason why millions of tourists explore Old Town Scottsdale each year and so many more choose it as the ideal location for their first or second home. The Arts. The Scottsdale Arts District is world-renowned, boasting famed professional galleries and studios. There’s the Scottsdale ArtWalk every Thursday night. The self-guided tour takes art-goers for a casual stroll along Main Street and Marshall Way and offers everything from contemporary pieces to Southwest landscapes. The annual Scottsdale Arts Festival is another a high point in the art scene here. The springtime event brings nearly 200 artists from around the world, concerts, tons of food vendors, and more. The Shopping. Scottsdale’s shopping is second to none. There’s Native American trading posts with the finest turquoise and hand-crafted jewelry. Local, high-end boutiques dot the downtown corridor, and designer shops line the Scottsdale Fashion Square Mall — also known as the Southwest’s largest shopping destination. From Carolina Herrera to Jimmy Choo… Neiman Marcus to Barneys… it’s all the makings for a high-end shopping spree. The Wine. Arizona is also home to — believe it or not — local vineyards. And Old Town Scottsdale is the ultimate wine tasting location. There’s the Scottsdale tasting room for Carlson Creek, which has vineyards along the Willcox Wine Trail. It features a stunning distressed copper bar, perfect for trying an oaky Chardonnay or bold Syrah. With a moody speakeasy vibe, Kazimierz World Wine Bar is another popular Old Town favorite and offers wines from all kinds of international locations. There’s no shortage of new dining concepts and hip eateries in Old Town. Here are some of the stand-outs. Top Chefs & Award-Winning Cuisine. FnB – With nods from the James Beard Foundation Awards four years running and named “the epicenter of creative Arizona cuisine” by Food & Wine magazine, FnB takes farm-to-table to another level. Virtu Honest Craft – Amongst the recognition for the 25-seat Mediterranean eatery, Virtu has been a James Beard Award semifinalist and called a “must-try” restaurant by The Wall Street Journal and Boston Globe. Citizen Public House – Bernie Kantak is one of the most well-known chefs in Arizona and for good reason. In addition to his Old Town concept being named a Best New Restaurant by countless publications in its first year, he created an iconic Southwest chopped salad that currently has its own website, social media and cult following. Cowboy Ciao – The Southwestern staple has been winning awards and dishing out Modern American cuisine in Old Town for two decades now. It’s a place visited by the who’s-who and those with sophisticated palates. Barrio Queen – James Beard Award nominee Silvana Salcido Esparza started Barrio Queen in 2012 and brought Mexico City fare to Old Town. Featuring hundreds of tequilas, it’s one of the largest tequilerias in the US and a great place to do some tequila tasting while in town. Olive & Ivy Restaurant & bar – The Mediterranean-style restaurant has an outdoor patio worthy of its many accolades and decades-long reputation. It’s one of the most stylish places on the Scottsdale waterfront. There’s also an elegant indoor venue, called the Stamp Room, for those interested in a more private dining experience. Old Town has the American steakhouse classics. There’s Mastro’s City Hall, known for its posh decor and superior steaks, and J&G Steakhouse, which offers floor-to-ceiling city views in addition to award-winning culinary creations. Sushi Roku – Considered one of the top restaurants in the Valley, Sushi Roku is an upscale favorite. It is located within the swanky W Scottsdale hotel and turns modern Asian cuisine into art. Scottsdale has more destination spas per capita than any other city in the U.S., according to MONEY magazine’s Best Places to Live piece in 2016. The Phoenician was named as one of them. The Phoenician – It’s the epitome of 5-Star luxury. While its hallmark spa, the Centre for Well-Being, is under transformation and will reopen early 2018, there’s still plenty of ways to relax and rejuvenate. Take a dip in its hand-tiled relaxation pool. Kick back under a shady cabana. Play one of Golf Digest’s “Top 75 Golf Resorts in America.” Sip on one of the best Margaritas in town, made from your choice of 200+ different types of tequila. Or enjoy a traditional British Afternoon Tea, which happens every day from 2 to 3 p.m.
Bespoke Inn – The high-end boutique hotel offers luxury with a personal touch. It’s a charming spot with century-old olive trees, a rooftop garden, award-winning restaurant, and loaner bicycles. And not just any bicycles: British Pashley City bicycles complete with bells and baskets. It’s a perfect way to tour the art galleries right outside your door. Old Town Scottsdale is also known for its vibrant nightlife and VIP service. And you can’t mention the Entertainment District without mentioning the W Scottsdale Resort. It’s right in the middle of it all. Step outside the hotel and there’s a number of bars and restaurants right at your feet. You don’t have to go far to find a good time. In fact, there’s something to do on location – day or night. Its rooftop pool, for instance, is open 24/7 and offers a lively, stylish environment. There’s also champagne bottle service offered in the lounge-y Living Room or swanky Shade Lounge. The Beverly is another late-night hotspot and little-known secret for those looking for a more intimate environment. The dimly lit high-end bar features a vintage aesthetic and classic cocktails. Old Town Scottsdale takes the luxury lifestyle to another level. And the only way to truly understand it… is to experience it. Take some time to discover Scottsdale and be sure to share your favorites with us!